Rediff.com » News » Trouble brewing for Xi? 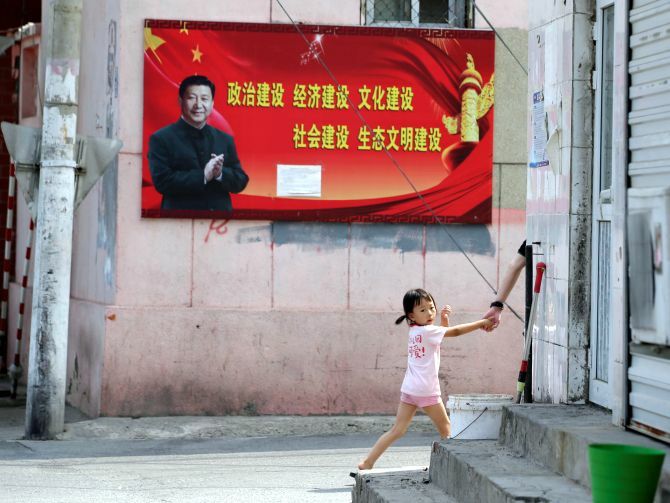 The Chinese leader is today facing some open, or less subtle, criticism from within the party and from liberal intellectuals who are increasingly concerned by the concentration of power in his hands and the increasing authoritarianism of the regime, says Claude Smadja. 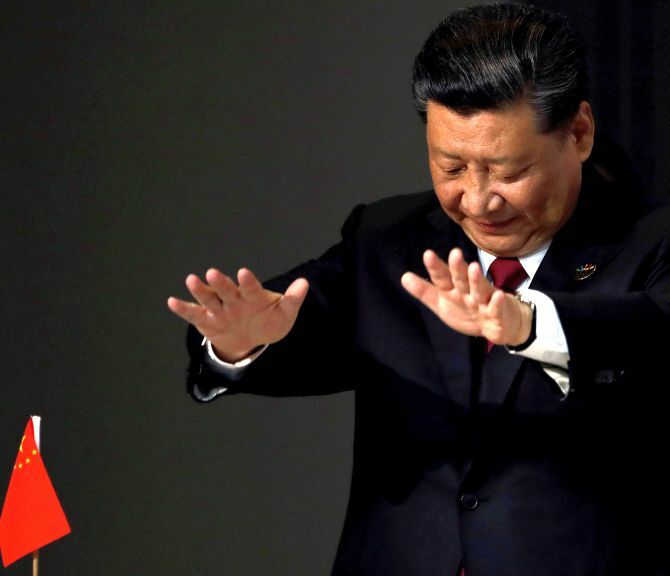 Has Chinese President Xi Jinping overplayed his hand in displaying too much overconfidence and asserting too early and too strongly China’s ambition to be “very close to the center of the international stage”? Has he underestimated Donald Trump’s determination to “re-balance” -- and in fact revisit -- the United States-China trade and economic relationship? If this is the case, to what extent will this impact the Chinese leader’s authority and grip on power? The rumour mill in China has been abuzz with speculations about these questions, with some observers even wondering if this is not the opportunity some of the previous leaders in the power structure -- former presidents Jiang Zemin and Hu Jintao -- had been waiting for to put into question the decision made last March to remove the two-term limit on the presidency, effectively allowing Xi to remain in power for life -- if he wishes so. Given the shroud of secrecy surrounding the inner workings of the Chinese top power structure, these kinds of speculation might remain just speculation with no outward signs that the president’s authority or his grip on power has, in any way, been substantially diminished. The only change noticeable in the last period has been the way the official propaganda machine has toned down any gloating about China’s new advances on the international scene, and the almost elimination of any mention of the “Made in China 2025” initiative -- one of the top signature projects of President Xi. There has been a belated realisation in Beijing that the ambition outlined in this project to establish China as a high-tech superpower and the grave concerns this has created in the US and Europe -- that China’s industrial policies would put European and American firms at a disadvantage -- were generating a very serious backlash. Which leads to the central question behind the present trade war initiated by the Trump administration: Is it just a way to deal with the huge and increasing trade deficit that the US has with China? Or are we rather witnessing the start of a war for technology supremacy between the two most powerful countries on earth? One would tend to consider that the latter interpretation might be closer to the reality than the former: It is not only trade that Washington is concerned about but also the much broader question about US’ security and supremacy if America’s technological edge keeps getting eroded by China’s advances. On August 13, US President Trump signed into law The Foreign Investment Risk Review Modernization Act, which expands and tightens the scrutiny and the review process undertaken until now by the Committee on Foreign Investment in the United States. FIRRMA clearly has Chinese investments in the US in its sights. In fact, to put it in stark tones, the logic of the whole process has now turned upside down: Instead of considering that an acquisition of a US company by a Chinese one should proceed if no national security implications can be assumed, any new Chinese acquisition is now considered as potentially affecting US security unless proved otherwise. And the new law intends also to scrutinise joint-ventures that US companies might undertake outside the US with foreign companies if potential national security implications can be surmised. Washington can take solace from the fact that Germany, the United Kingdom, and Australia are also tightening scrutiny on Chinese acquisitions. For the US -- and some European countries -- these new laws are just ways to deal with an emerging power that they see flouting the rules. For China, what is happening now is a new avatar of a containment policy aimed at slowing down or even derailing the country’s ascent to its deserved place on the international stage. This is where we get back to the question of how the present situation might impact on Chinese President Xi’s authority and grip on power. The Chinese leader is today facing some open, or less subtle, criticism from within the party and from liberal intellectuals who are increasingly concerned by the concentration of power in his hands and the increasing authoritarianism of the regime. He might tone down the regime propaganda machine on the personality cult built around him and the country’s achievements and its ambitions. Moreover, much greater discretion about “Made in China 2025” and its objectives will also certainly continue. There will definitely be some concessions made to foreign companies operating in China in terms of their range of activities or even opening new domains such as financial services and markets. However, such a course correction -- more caution and maybe a slowing down of the pace -- will not mean a change in the objectives. Chinese President Xi has grown in power -- and surrounded himself with people who, by and large, share his vision about China’s future. The country will again rely on its extraordinary resilience, the fact that its power structure of command and control allows it to implement and enforce decisions fast, to go through the difficulties created by the present punitive tariffs, and the new ones that might be implemented soon by the Trump administration on Chinese imports. The emphasis that had been put at the beginning of the year on deleveraging and reduction of financial risk is now being balanced by a looser monetary policy, new financing for infrastructure projects, and companies whose exports may suffer from the new tariffs. This will not mean any decisive eroding or weakening of Xi’s leadership. First of all, because there is nobody inside the party who has the stature or the support base to be seen as an alternative to him. And, even more important, because in what is presumably the most important challenge that the Chinese leader has had to face since coming to power, he can count on the nationalism that can be easily stirred up against any country portrayed as conspiring against China’s economic future and its due place on the international stage. For the moment, Beijing’s reaction to the Trump administration measures has been relatively subdued apart from the official rhetoric against “Trump’s bullying”. Some Xi Jinping partisans have been disappointed by what they see as the lack of decisive reaction, which has even been attributed to dissensions between hard-liners and advocates of more concessions to the US. If the present trade war were to endure, and if the Chinese suspicions -- that this is a facet of a new anti-China containment policy were to be confirmed -- Xi will have to decisively show his mettle or see his authority seriously put into question. Claude Smadja is President of Smadja & Smadja, a strategic advisory firm. You can reach out to him on Twitter @ClaudeSmadja.